I love herbs, and I also enjoy alcohol. My dedicated readers know for sure that I adore honey…so it shouldn’t surprise you that I generally do my best to combine those three ingredients in as many forms as possible. My apothecary is packed tight with jars and those jars are full of strange floating herbal bits in colored liquid, waiting for their time to be strained. I have many jars that are medicine, and jars that are for fun, and jars that are a bit of both. My booze cabinet is stocked with bottles of all sizes and colors, ready for a tipple and a taste by guests. It makes me feel my most witchy to open that cabinet and bring out strange brews to share with friends. There’s a delight in enjoying last summer’s peach harvest in a delicate cordial glass while staring out at the blowing snow outside in the middle of winter! 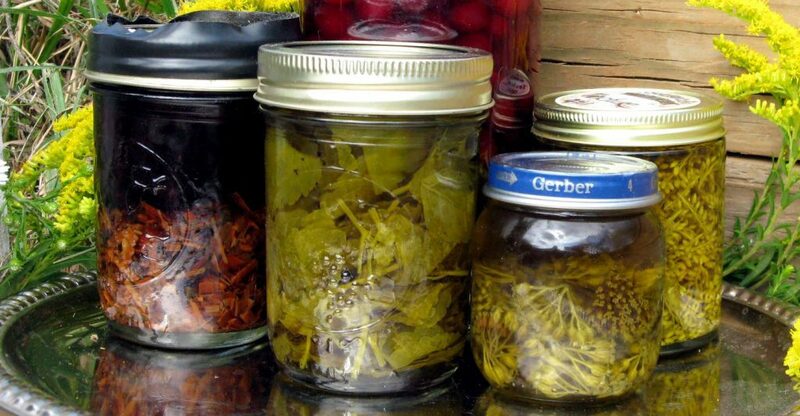 When you start delving into recipes and techniques for making some of these projects in your own kitchen, you might notice a lot of varying terms: tinctures, elixirs, cordials and beyond! Like the folk names of plants that are attributed to different plants, herbal preparations are called by various names by different cultures. The definitions that follow are generally accepted, but your mileage may vary! I’ll point out some of the differences as we proceed through the boozy vocabulary lesson below. Tinctures are medicinal extracts of herbs in alcohol. Tinctures are often made with moonshine or similarly high-test liquors, but vodka, rum, and even brandy can work well. I tend to most often use a medium-shelf, triple-distilled vodka for the tinctures I craft for my household (and sell in the shop!). When I have it on hand, I like to use moonshine or other high-proof booze for tincturing roots or resins. Get an herb, fresh or dried. Put said herb into a jar – fill the jar completely with fresh herb, or half-full with dried herb. Pour enough alcohol into the jar to cover the herb. Put a lid on it, label and date it, and give it a good shake every now and again. Stash it in a dark cabinet for about 3-6 weeks. 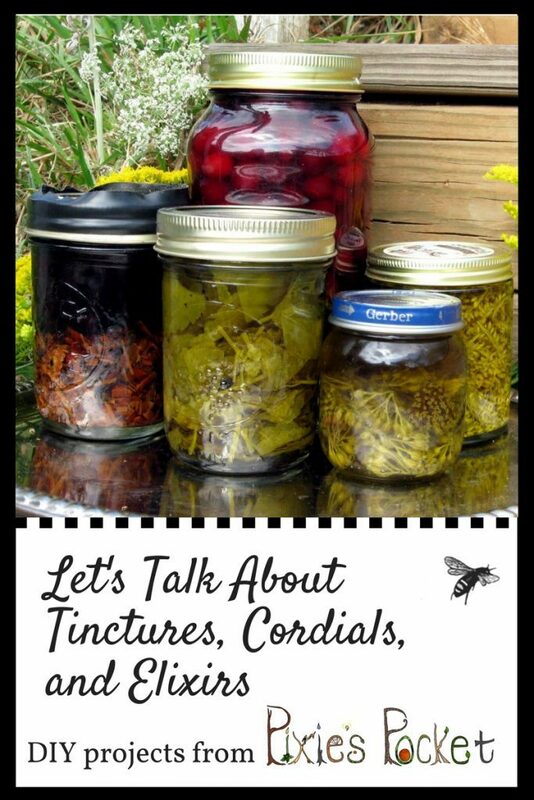 Use as needed for many years – tinctures retain their strength best when stored out of direct light. Now, tinctures are potent! When you take tinctures, please do your research before dosing yourself or find a practiced herbalist to give you guidance. Some tinctures, such as poke root or teasel, only need a couple of drops per day to be effective and more than that can cause you harm. Also, some common herbs can interact with prescription medications. It’s better to be safe than sorry! Elixirs are the sweetened version of alcohol-expressed medicines. I enjoy making “sipping” elixirs out of the tastier herbal tinctures. The sharp tang of elderberry cordial is a lovely flavor, but I try to save my elderberry cordial only for when I’m feeling sick. While it is tasty and sweet, it is still a strong medicine! These can almost cross the line into cordials, which are mostly just for pleasure and flavor as far as my definitions go. The above Instagram example is made of peaches and bee balm, a delight on the tongue – but bee balm has medicinal qualities as well. I also learned from Lindy Wildsmith in her book Artisan Drinks (read my review here) that cordial often means a non-alcoholic beverage in the UK. To use an elixir or cordial, just pour a bit into your hot tea or straight into a small glass to slowly sip and enjoy! 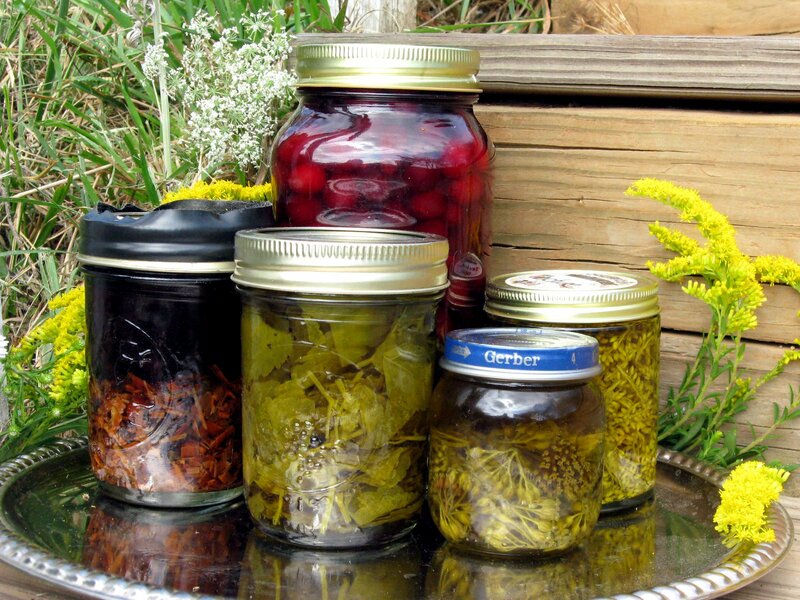 Elixirs can also help with the less-than-tasty herbal medicines. Remember, “just a spoonful of sugar makes the medicine go down!” Adding a sweetener to bitter or astringent herb tinctures can make ingesting them a more palatable experience, especially with kids. Valerian and Horehound are good examples of herbs that can use a splash of honey to cut their bitter strength! Start out with a tincture and make it sweet! You can use the simple syrup recipe below. Add the syrup to tincture a bit at a time, shake or stir to blend, and then taste. Repeat until you feel you have it right! An important note: remember, this is medicine! Elixirs and tinctures are meant to be taken in small quantities. If you aren’t careful, this sweetening and tasting process can get you loopy! Let it return to a boil for one minute. Turn to low and let it simmer for a few more minutes. Allow the syrup to cool down before funneling into a clean glass bottle with a tight-fitting lid. Label and date your syrup and store it in the fridge. Sometimes I use a lazier method to sweeten my tinctures. Pour a dollop of honey into a strained tincture and give it a shake until it is dissolved (or until your arm falls off). It works, but it will likely end up being super sticky and thick compared to the simple syrup sweetening process described above. I hope that helps to demystify some of the processes and encourages you to play around in your kitchen and have another way to use your herb harvest before the final frost takes it from you! Watch me ramble about cordials for an entire hour! Great post and gorgeous pictures! I have my good share of strange bottles filled with herbs as well! For your delicate-tummied love, I would suggest fennel. I suffer from bad nights too if my dinner has been too much, and a cup of fennel tea (or tincture) does wonders! If you don’t have it near, I can send you seeds from our own plant. I just found this blog, and wow, is it ever full of great information. I have started growing all kinds of medicinal plants, but really am not sure which parts to harvest and when. Is there a resource you would suggest? Ooh, yes. He used to just chew a couple of fennel seeds, but now that bothers his teeth. I’ll have to try him on a tea of that, it isn’t his favorite flavor. 🙂 Mint is much more his style, and I have a non-Valerian mint elixir that he enjoys swigging that doesn’t put him to sleep! Hey dear. We weren’t talking specifically about the herb you are discussing, but herbs in general. While I am quite a fan of CBD and its healing properties, I’m not in a state that allows its legal use. I do host local herb swaps, but we stick to legal plants. I don’t have any seedlings/strains you are looking for, sorry! I have a lovely garden but just recently started making my own teas and tinctures and also use herbs in spiritual practice. This awesome blog has a wealth of information. Thank you so much! Great post! Thanks for the herbal info. I like the info on elixir too…never made one of those but love tinctures. Thanks again! I’m a new follower too, blessings! Hey there! Thanks for asking me, Lee Ann. I’ve had some cordials and tinctures that are years old. The booze does a good job of long term preservation, but there’s always a danger of fermentation or mold when there’s water and sugar added. If you open a jar and it smells like cheap wine or if it is fuzzy, don’t drink it! One of my favorite, I guess its a tinture, I just never thought of it that way, is soaking dried ginger root in vodka for a few months. Its warm, spicy to sip neat, and it really helps w/ the bursitis pain that really acts up worse for me in the winter months. Dried cranberries soaked that way too make a nice sweet like ruby red cordial, never done it w/ fresh or frozen cranberries. The teenager confiscated all of the frozen ones for smoothies. I did a batch last year of vodka and orange zest, which is still sitting there and I’m not quite sure what to do with, since it released a nice amount of orange oil on the top. Any suggestions? I love ginger in all forms! That sounds like an awesome method to help with the joint and muscle pain, for sure. 🙂 I have considered making cordials with dried fruit but haven’t done it yet! I bet if you add a sugar syrup to the strained orange vodka, that it might help with blending those oils in. I’d still definitely give it a good shake before drinking! What alternative to vodka would you recommend for someone who can’t consume alcohol? Ah, non-alcoholic cordials can be made by a few different methods. You can make a glycerite or make cordials with just water, lemon, and berries like this lovely recipe! You can also infuse herbs in vinegar instead of alcohol. 🙂 I hope that helps! You can make communion wine with poke. Add to liquor and varying degrees of water and sweetener. Or use vinegar or lemon juice with varying degrees of water and a large sweetener. Color can be a deep burgundy. The vinegar poke mixture looks nice in the window. It could be the only note of color in a church. I am not sure how long the color lasts. I’ll bet that is lovely; however, poke is strong medicine and shouldn’t be consumed often! The seeds within the berries can be very toxic to humans. Beautiful post. Very helpful! Thank you for sharing your kitchen witchery with us. I am concocting a cbd tincture out of a pure amber distillate and am using 180 proof alcohol. I am wanting to add spring water and honey to create a more palatable experience. Would you recommend just adding that to the finished tincture? Thank you! I’m so sorry for my failure to reply! I missed this comment entirely. I hope that you were able to finish the nettle elixir. Using honey or syrup is best for long-term storage, in my experience. Anything with excess moisture, like the fruit juice or cordial, boosts the chances of spoilage. What did you end up doing? Happy New Year!